This Article will answer the following questions? What is Adblue / Diesel Exhaust Fluid (DEF)? What does Adblue / DEF do and how does it reduce NOx? Why does Adblue need to be a pure 32.5% urea solution and why is it important to test it to ISO22241-2? Why do I need to use a supplier that uses as independent lab to verify the Adblue quality? AdBlue or Diesel Exhaust Fluid (DEF) is a solution of 32.5% Urea in de-ionised water. It is sprayed into the exhaust system of modern engines as part of a selective catalytic reduction system (SCR) to reduce NOx (nitrogen oxides) emissions from the exhaust that cause acid rain and lung problems. How is NOx made that Adblue removes? Modern diesel engines run with a lean fuel to air ratio, which reduces un-burnt fuel being sent out the exhaust. However, this also means that the heavy air laden mixture containing predominantly nitrogen at high temperatures of combustion can form NOx. Adblue is one of two commonly used methods to reduce NOx emissions as part of a SCR. The other being Exhaust Gas Re-circulation (EGR) systems that recirculate the exhaust gases with lower oxygen content to reduce peak cylinder temperatures and hence NOx production, but this requires strict maintenance of diesel particulate filters as less oxygen means more un-burnt fuel. In some engines both technologies are used to achieve the ever tightening emission standards. How does Adblue work to remove NOx? Adblue works by decomposing to Ammonia and Carbon dioxide at high temperatures of the exhaust. The Ammonia (NH3) in the presence of oxygen (O2) in the air plus the catalyst forms Nitrogen (N2) and water (H2O). Vehicles with a SCR system have a sensor that detects the presence of NOx, which triggers a spray of Adblue into the exhaust. Why is urea used rather than Ammonia as CO2 is just a waste product and it’s the ammonia doing the work? The problem is transport. Ammonia is a more restricted substance to transport than urea and being a gas means it would need to transported under high pressure. Ammonia has an extremely strong smelling salts type odour, and in an enclosed space could knock someone out. It is also a flammable gas. Hence it is only wanted to be produced in small quantities when required. Because urea is safer to transport, the CO2 bi-product as a greenhouse gas is a necessary compromise and equally since the CO2 was absorbed from the atmosphere to make urea it is net carbon neutral. Ammonia is measured in new product by the Alkalinity as NH3 test. Why does Urea need to be 32.5%? This mixture gives the best freeze point for the fluid at approx -11’C in which both the urea and water freeze at the same time. This means that the AdBlue concentration will not change and become diluted or over concentrated based on the weather as the solution freezes and thaws. Why does it need to be pure? Your catalytic converter is extremely susceptible to certain elements and compounds that even at low concentrations can poison the catalyst over times. 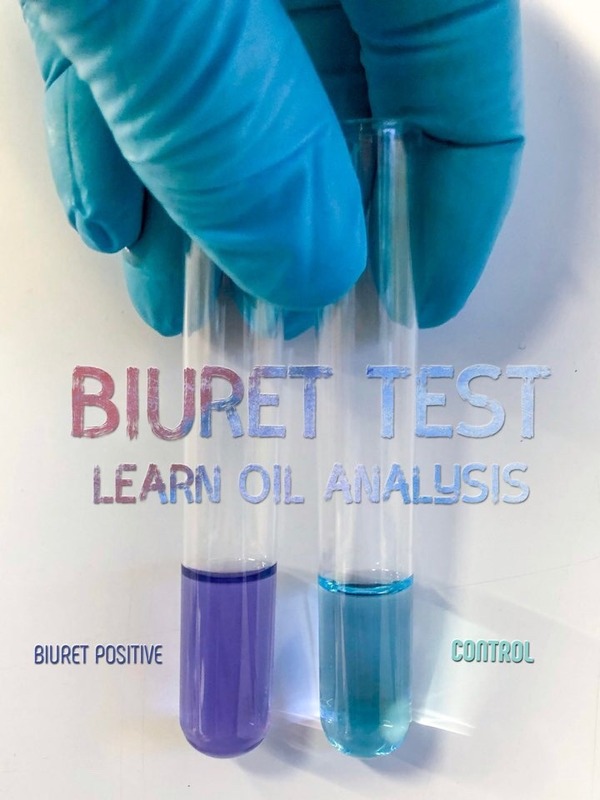 In fact, my father was involved in investigating some of the earlier cases of this happening back in 2007/2008 in Europe for some major vehicle manufacturers where catalyst poisons were leading to cement type material forming on the bricks (see below – What is Biuret?) These poisons include is Phosphate (PO4), commonly found in other urea products like fertilisers, Sodium found in engine coolants and salt water and calcium and magnesium found in tap water. These are all extremely easy to introduce as low levels and hence the quality of production process has to be tightly controlled to ensure only the purest urea solutions go on sale as Adblue. Even after sale, contamination control is still important such as ensuring containers used for engine coolant containing either sodium or potassium are not also used for Adblue, and that storage containers are ideally plastic as Adblue is caustic to metals such as Copper and Aluminium which when dissolved are also catalyst poisons. Equally, cross contamination with other products such as diesel also greatly impact the effectiveness of Adblue. Biuret or carbonylurea has been a known impurity of urea solutions for decades where the reaction ends up joining two urea molecules together. It was classically monitored to keep low in the fertiliser industry before the use of Adblue as Biuret is damaging to crops. In SCR systems Biuret becomes a problem because it can polymerise further in the exhaust and coat catalyst bricks with a cement type material that prevents the catalyst from working. This prevents NOx being removed and causes a viscous cycle of more Adblue being sprayed in overdosed quantities causing more polymer to be formed eventually painting the bricks with a cement like material. The issue is compounded when the Adblue also contains catalyst poisons that lead to even more Adblue being sprayed into the exhaust. 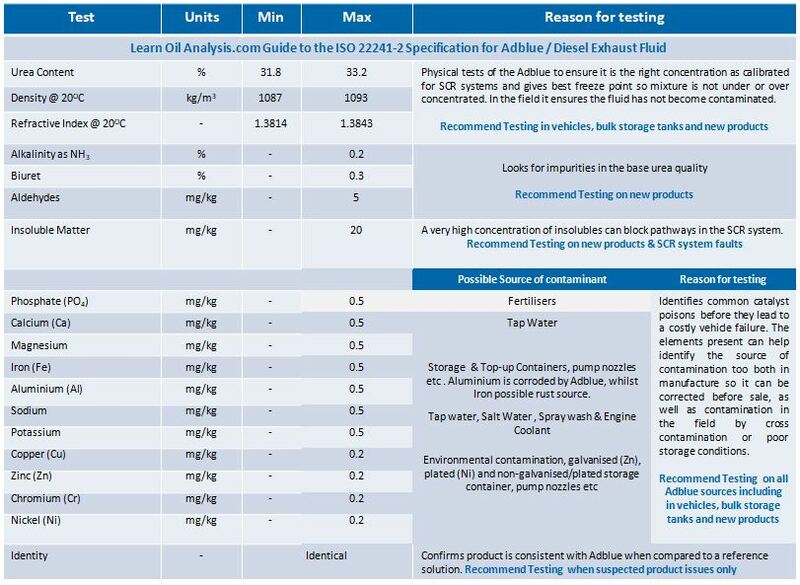 Why should AdBlue be tested to ISO 22241-2? ISO 22241-2 is the current used standard across Europe for AUS32 (chemical name for Adblue as Adblue is a trade name which is now the common usage term for the solution). The localised German Standard DIN70070 has now been largely superseded by its ISO 22241-2 counterpart in terms of limit thresholds. It is mandatory for new Adblue to be tested to the specification to be sold as ISO 22241-2 compliant. Some Adblue manufacturers may choose to perform all their testing in house, whilst others choose to use an independent lab to perform the analysis to prove the analysis is completely impartial. Analysis of each batch before sale ensures the quality of the Adblue meets the high quality standards of the ISO 22241-2 specification. Once sold, regular testing from bulk storage and vehicle tanks for common contaminants that may have happened after sale becomes critical, so measuring the urea content to confirm it has not been diluted, elemental analysis to detect presence of catalyst poisons and detection of fuel/oil in the sample are also important. The testing limits for ISO 22241-2 are as follows together when it is recommended to test for these parameters. Why do I need to use a supplier that uses an independent lab for quality control? As with any product you buy you want the confidence it is of a high quality. All Adblue manufacturers will test their own products before shipping to confirm the quality of their own production processes. However if the testing is performed in-house the verification that the product passed the ISO specification cannot by definition be considered in any way impartial. Considering in the early days of Adblue manufacture that hundreds of millions of pounds worth of vehicles catalytic converters across Europe were poisoned by poor quality and contaminated Adblue the importance to confirm the product is of a high quality becomes even more essential. Even with most manufacturing accreditations it is not mandatory (only recommended) for Adblue manufacturers to impartially test their products. That is why the most reputable suppliers choose to go the extra mile and differentiate themselves from the competition and give the extra proof that their product is not damaging to vehicle catalysts. So when choosing your Adblue supplier don’t forget to confirm they regularly use an independent lab to verify their product quality in addition to any in-house testing they perform. ← Lubricant elemental wear metal analysis – is your lab’s methodology failing to catch failures?